For the last week, I’ve been at the Institute Mittag-Leffler of the Royal Swedish Academy of Sciences for their program on mathematical biology. The institute is a series of apartments and a grand mathematical library located in the suburbs of Stockholm. And the program is a mostly unstructured atmosphere — with only about 4 hours of seminars over the whole week — aimed to bring like-minded researchers together. It has been a great opportunity to reconnect with old colleagues and meet some new ones. During my time here, I’ve been thinking a lot about effective games and the effects of spatial structure. Discussions with Philip Gerlee were particularly helpful to reinvigorate my interest in this. As part of my reflection, I revisited the Ohtsuki-Nowak (2006) transform and wanted to use this post to share a cute observation about how space can create an effective game where there is no reductive game. Suppose you were using our recent game assay to measure an effective game, and you got the above left graph for the fitness functions of your two types. On the x-axis, you have seeding proportion of type C and on the y-axis you have fitness. In cyan you have the measured fitness function for type C and in magenta, you have the fitness function for type D. The particular fitnesses scale of the y-axis is not super important, not even the x-intercept — I’ve chosen them purely for convenience. The only important aspect is that the cyan and magenta lines are parallel, with a positive slope, and the magenta above the cyan. This is not a crazy result to get, compare it to the fitness functions for the Alectinib + CAF condition measured in Kaznatcheev et al. (2018) which is shown at right. There, cyan is parental and magenta is resistant. The two lines of best fit aren’t parallel, but they aren’t that far off. How would you interpret this sort of graph? Is there a game-like interaction happening there? Of course, this is a trick question that I give away by the title and set-up. The answer will depend on if you’re asking about effective or reductive games, and what you know about the population structure. And this is the cute observation that I want to highlight. Last week, Jacob Scott was at a meeting to celebrate the establishment of the Center for Evolutionary Therapy at Moffitt, and he presented our work on measuring the effective games that non-small cell lung cancer plays (see this preprint for the latest draft). From the audience, David Basanta summarized it in a tweet as “trying to make our game theory models less abstract”. But I actually saw our work as doing the opposite (and so quickly disagreed). However, I could understand the way David was using ‘abstract’. I think I’ve often used it in this colloquial sense as well. And in that sense it is often the opposite of empirical, which is seen as colloquially ‘concrete’. Given my arrogance, I — of course — assume that my current conception of ‘abstract’ is the correct one, and the colloquial sense is wrong. To test myself: in this post, I will attempt to define both what ‘abstract’ means and how it is used colloquially. As a case study, I will use the game assay that David and I disagreed about. This is a particularly useful exercise for me because it lets me make better sense of how two very different-seeming aspects of my work — the theoretical versus the empirical — are both abstractions. It also lets me think about when simple models are abstract and when they’re ‘just’ toys. Recently, I’ve been thinking a lot about small projects to get students started with evolutionary game theory. One idea that came to mind is to look at games that have been analyzed in the inviscid regime then ‘spatialize’ them and reanalyze them. This is usually not difficult to do and provides some motivation to solving for and making sense of the dynamic regimes of a game. And it is not always pointless, for example, our edge effects paper (Kaznatcheev et al, 2015) is mostly just a spatialization of Basanta et al.’s (2008a) Go-vs-Grow game together with some discussion. Technically, TheEGG together with that paper have everything that one would need to learn this spatializing technique. However, I realized that my earlier posts on spatializing with the Ohtsuki-Nowak transform might a bit too abstract and the paper a bit too terse for a student who just started with EGT. As such, in this post, I want to go more slowly through a concrete example of spatializing an evolutionary game. Hopefully, it will be useful to students. If you are a beginner to EGT that is reading this post, and something doesn’t make sense then please ask for clarification in the comments. I’ll use the Go-vs-Grow game as the example. I will focus on the mathematics, and if you want to read about the biological or oncological significance then I encourage you to read Kaznatcheev et al. (2015) in full. At the heart of the Great Lakes region of East Africa is Tanzania — a republic comprised of 30 mikoa, or provinces. Its border is marked off by the giant lakes Victoria, Tanganyika, and Malawi. But the lake that interests me the most is an internal one: 200 km from the border with Kenya at the junction of mikao Arusha, Manyara, Simiyu and Singed is Lake Eyasi. It is a temperamental lake that can dry up almost entirely — becoming crossable on foot — in some years and in others — like the El Nino years — flood its banks enough to attract hippos from the Serengeti. For the Hadza, it is home. The Hadza number around a thousand people, with around 300 living as traditional nomadic hunter-gatherers (Marlow, 2002; 2010). A life style that is believed to be a useful model of societies in our own evolutionary heritage. An empirical model of particular interest for the evolution of cooperation. But a model that requires much more effort to explore than running a few parameter settings on your computer. In the summer of 2010, Coren Apicella explored this model by traveling between Hadza camps throughout the Lake Eyasi region to gain insights into their social network and cooperative behavior. The data she collected with her colleagues (Apicella et al., 2012) provides our best proxy for the social organization of early humans. In this post, I want to talk about the Hadza, the data set of their social network, and how it can inform other models of cooperation. In other words, I want to freeride on Apicella et al. (2012) and allow myself and other theorists to explore computational models informed by the empirical Hadza model without having to hike around Lake Eyasi for ourselves. Recently, Jake Taylor-King arrived in Tampa and last week we were brainstorming some projects to work on together. In the process, I dug up an old idea I’ve been playing with as my understanding of the Ohtsuki-Nowak transform matured. The basic goal is to work towards an operational account of spatial structure without having to commit ourselves to a specific model of space. I will take replicator dynamics and work backwards from them, making sure that each term we use can be directly measured in a single system or abducted from the other measurements. The hope is that if we start making such measurements then we might see some empirical regularities which will allow us to link experimental and theoretical models more closely without having to make too many arbitrary assumptions. In this post, I will sketch the basic framework and then give an example of how some of the spatial features can be measured from a sample histology. Two of my goals for TheEGG this year are to expand the line up of contributors and to extend the blog into a publicly accessible venue for active debate about preliminary, in-progress, and published projects; a window into the everyday challenges and miracles of research. Toward the first goal, we have new contributions from Jill Gallaher late last year and Alexander Yartsev this year with more posts taking shape as drafts from Alex, Marcel Montrey, Dan Nichol, Sergio Graziosi, Milo Johnson, and others. For the second goal, we have an exciting debate unfolding that was started when my overview of Archetti (2013,2014) prompted an objection from Philip Gerlee in the comments and Philipp Altrock on twitter. Subsequently, Philip and Philipp combined their objections into a guest post that begat an exciting comment thread with thoughtful discussion between David Basanta, Robert Vander Velde, Marc Harper, and Philip. Last Thursday, I wrote about how my on-going project with Robert, David, and Jacob Scott is expanding on Archetti’s work and was surprised to learn that Philip has responded on twitter with the same criticism as before. I was a little flabbergast by this because I thought that I had already addressed Philip’s critique in my original comment response and that he was reiterating the same exact text in his guest post simply for completeness and record, not because he thought it was still a fool-proof objection. My biggest concern now is the possibility that Philip and I are talking past each other instead of engaging in a mutually beneficial dialogue. As such, I will use this post to restate (my understand of the relevant parts of) Philip and Philipp’s argument and extend it further, providing a massive bibliography for readers interested in delving deeper into this. In a future post, I will offer a more careful statement of my response. Hopefully Philip or other readers will clarify any misunderstandings or misrepresentations in my summary or extension. Since this discussion started in the context of mathematical oncology, I will occasionally reference cancer, but the primary point at issue is one that should be of interest to all evolutionary game theorists (maybe even most mathematical modelers): the model complexity versus simplicity tension that arises from the stochastic to deterministic transition and the discrete to continuous transition. Is cancer really a game? A couple of weeks ago a post here on TheEGG, which was about evolutionary game theory (EGT) and cancer, sparked a debate on Twitter between proponents and opponents of the idea of using EGT to study cancer. Mainly due to the limitations inherent to Twitter the dialogue fizzled. Instead, here we are expanding ideas in this guest blog post, and eagerly await comments from the others in the debate. The post is written by Philip Gerlee and Philipp Altrock, with some editing from Artem. We will situate the discussion by giving a brief summary of evolutionary game theory, and then offer commentary and two main critiques: how spatial structure is handled, and how to make game theoretic models correspond to reality. Can we describe reality? As a general philosophical question, I could spend all day discussing it and never arrive at a reasonable answer. However, if we restrict to the sort of models used in theoretical biology, especially to the heuristic models that dominate the field, then I think it is relatively reasonable to conclude that no, we cannot describe reality. We have to admit our current limits and rely on thinking of our errors in the dual notions of assumptions or approximations. I usually prefer the former and try to describe models in terms of the assumptions that if met would make them perfect (or at least good) descriptions. This view has seemed clearer and more elegant than vague talk of approximations. It is the language I used to describe the Ohtsuki-Nowak (2006) transform over a year ago. In the months since, however, I’ve started to realize that the assumptions-view is actually incompatible with much of my philosophy of modeling. To contrast my previous exposition (and to help me write up some reviewer responses), I want to go through a justification of the ON-transform as a first-order approximation of spatial structure. Careful readers might have noticed that, until last night’s post, the blog was silent for an atypically long 10 days (17 days since I last posted). As usual, the primary culprit is laziness, but this time it is not alone! After my fun visit to the Integrated Mathematical Oncology Department of the Moffit Cancer Research Center, I have been working closely with Jacob Scott and David Basanta to finish up our first joint paper. The last week was particularly busy as we pushed the paper out for submission and posted a draft to the ArXiv. We look at the effect of spatial structure, in particular a spatial boundary, on the evolutionary dynamics of motility in cancer. For a tumor, one of the key steps in going from a benign to malignant is gaining the ability to spread from one organ to another non-adjacent organ. 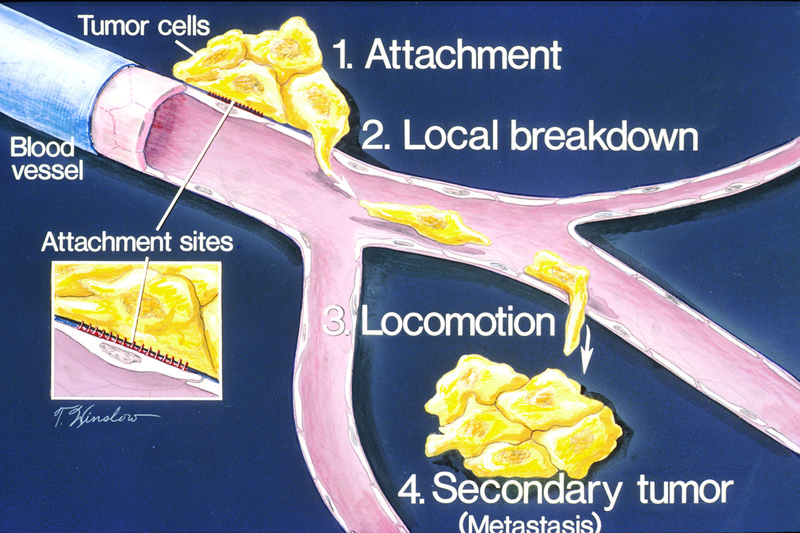 To achieve this, a cancer cell has to transition from simple proliferative cells (AG) to a motile ones (INV). However, motility usually involves a cost to the organism. We show that spatial structure can lower this cost, and smaller neighborhood size at an edge can promote motile cells at the boundary even when they are absent in the tumour body.